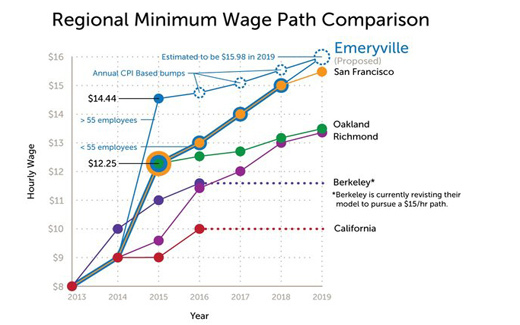 EMERYVILLE, Calif. – This small city, in the East Bay across from San Francisco, is putting its minimum wage on track to become the highest in the nation, following a unanimous City Council vote May 5. After a final procedural reading of the new ordinance May 19, the minimum wage at small businesses will rise to $12.25/hour on July 1, with a path to $15 by 2018. Big employers will pay the city’s living wage of $14.44. The two wages will converge in 2019 at nearly $16, with annual cost of living increases after that. All workers will also earn 6-9 days of paid sick leave. The Council’s action follows many months of discussion during which a consensus was built on the issue among residents, workers, faith leaders and small businesses. Mayor Ruth Atkin and council members said the crisis of income inequality led to their decision. Over two dozen people participated in the public comment period, with little dissent and a few procedural suggestions. “I have two jobs, and it’s hard to pay for transportation to get to school so I can get an education,” Emerald Jenkins, a 16-year-old Emeryville Pak ‘n Save worker who is paid just $9/hour, told the Council. SEIU 1021 East Bay spokesperson Shum Preston put Emeryville’s action in the context of nationwide and regional developments. Starting with San Francisco in 2003, he said, and shifting to fast forward in 2011-2014, the movement has won higher minimums in 19 cities or counties, covering some 11 million workers. 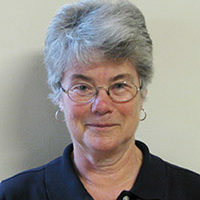 As the Council prepared to vote, Mayor Ruth Atkin said her goal had long been to “lift the floor of poverty” so no one working full time would need public assistance. With income inequality “growing out of control,” she said, it was important for the city to be part of a “tempered, regional approach” that would also take into account the needs of small businesses. Emeryville is indeed joining an East Bay regional trend. Neighboring Oakland raised its minimum wage to $12.25 with annual cost of living increases, after 82 percent of voters approved a ballot measure last November. Neighboring Berkeley has set its minimum to reach $12.53 by October 2016, while in November San Franciscans approved a gradual increase to $15 by 2018. Nearby Richmond is moving from its present $9.60 toward $12.30 in 2017, with cost of living increases to follow. The movement toward higher minimum wages is also being felt in other parts of the Bay Area. Palo Alto, on the peninsula south of San Francisco, is also moving toward $15 an hour by 2018, with a City Council committee proposing a rise to $11 on Jan. 1, 2016, followed by annual increases to be approved by the Council. Last month labor and community activists in the South Bay – home to tech powerhouse Silicon Valley – launched a new coalition to fight for low wage workers. The urgency of that struggle is highlighted by figures showing huge and growing gaps between the highest and lowest earning racial and ethnic groups, amidst soaring living costs. San Jose and Sunnyvale now have minimum wages of $10.30, and neighboring Mountain View is set to reach that level on July 1. All three cities will adjust annually for inflation. Labor, faith and community groups are working on the issue in Santa Clara, Los Altos, Cupertino and neighboring cities. California’s state minimum is now $9, set to rise to $10 in 2016. State Senators Mark Leno, San Francisco and Connie Leyva, Chino – both Democrats – have introduced SB 3, to increase it to $13 in 2017. Meanwhile, the federal minimum remains pegged at $7.25 an hour.